Connemara marble Celtic ring features Trinity knots on both sides of the setting. The Connemara marble that is featured in this Celtic ring is the only natural green marble in the world; fittingly, Connemara marble is only found in Ireland. This sterling silver Celtic ring features a dimensional oval shaped Connemara marble stone in the center that is flanked by filigree Trinity knots on both sides and the face measures 1/2” wide. This Trinity ring is gift boxed with Celtic knot and Connemara marble history cards, complements of The Irish Gift House. 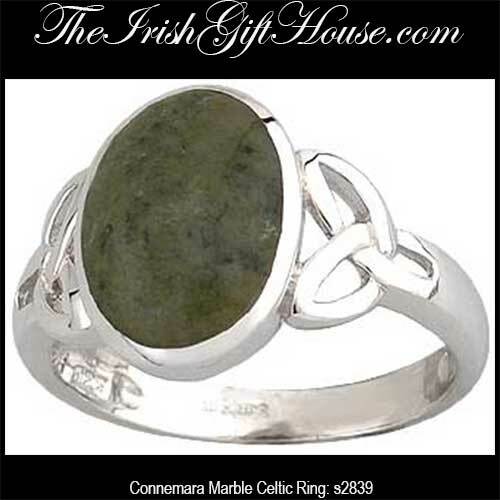 The Connemara marble Celtic ring is made by Solvar Jewelry in Dublin, Ireland; it is part of their Fáilte Ireland Collection. This Celtic ring has been hallmarked sterling silver by the Irish Assay Office at Dublin Castle in Ireland. This women's Celtic ring is available in sizes 4 through 9, full sizes only. Sterling silver Celtic ring features filigree Trinity knots on both sides of the Connemara marble setting. Sterling silver Celtic ring features a Trinity knot with inlaid Connemara marble. Sterling silver Claddagh ring features a Connemara marble heart. Connemara marble heart Claddagh ring in sterling silver features a Celtic knot band.